I found this recipe on RecipeZaar, but it’s originally from a book called “Stop and Smell the Rosemary“. We’ve made this one quite a few times, and have modified the original by cutting the oil in half, cutting back the cumin to a 1.5 tablespoons, and using fire roasted tomatoes. You’ll save a lot of time if you cook/shred the chicken (about 2 cups) while the soup simmers for 30 mintues; you add it just before serving. It’s delicious topped with diced avocados or, as we did tonight, with cilantro and homemade tortilla strips. This entry was posted on Tuesday, April 10th, 2007 at 9:20 pm	and is filed under Latin, Main Dishes. You can follow any responses to this entry through the RSS 2.0 feed. You can leave a response, or trackback from your own site. 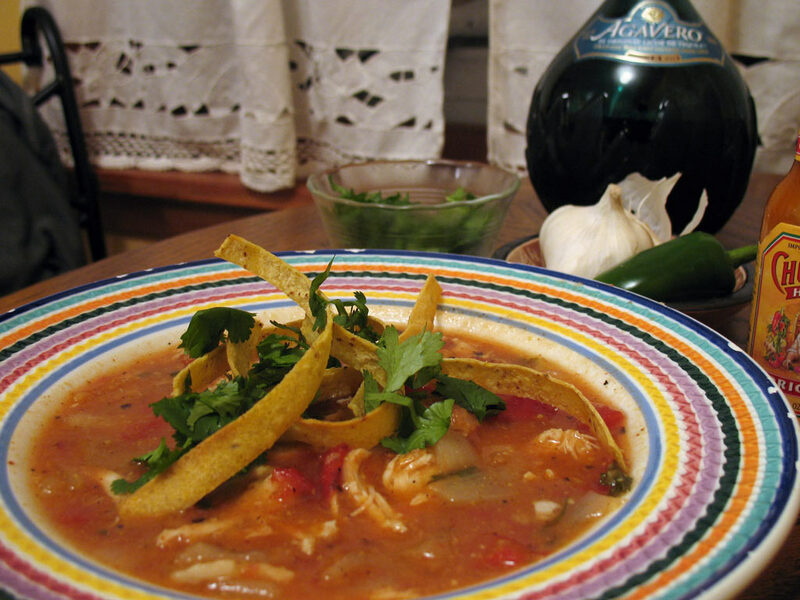 tortilla soup is the best. i’ve got some other recipes like this i’ll share with you soon…including a great corn/crab chowder. Yummo.